This year’s Christmas will be quite unlike any other we’ve had especially since it’s the first Christmas spent outside Malaysia. Today marks our third day in the UAE, and after the exertions of the past two days Ginny and Sern decided to give us a day off to rest and recuperate. Today will be spent lounging around and ambling along around the Dubai Marina area. Knackered by the adventure we had yesterday at Bur Dubai and Deira we collectively slept in and awoke close to 9:00am. After a quick shower we headed out of our apartment complex and walked north east along Dubai Marina Walk, a seven kilometre walkway circling around the Marina. A short walk away is the Dubai Marina Mall, and on its terraces are a few eateries. Ginny and Sern decided that we would have brunch at Le Pain Quotidien, a comfy café overlooking the Marina. After a hearty and organic breakfast we resumed our walk along the Marina Walk in the opposite direction due south west until we got to the bridge along Al Gharbi Street. We walked along the bridge due North West right up to the end of the street, which took us to a cluster of skyscrapers in an area known as Jumeirah Beach Residence, or JBR for short as it is fondly known among the local community. JBR is a 1.7 kilometre long, 2 square kilometre area of waterfront community located against the Persian Gulf here at the Marina and is a residential development that contains forty towers. Cat and I marveled at the magnificence and splendor of the entire area, which housed among other things Hilton Dubai Jumeirah Resort, Sheraton Jumeirah Beach Resort, The Ritz-Carlton and the Le Royal Meridien Beach Resort, not to mention the world-renowned JBR Beach. This was indeed Dubai’s ‘Golden Mile’. It was here that we found a store called I Love Dubai selling souvenirs and trinkets from the UAE, which leads us to a peculiar story that we just had to re-tell. The day before at Ibn Battuta Mall as we entered the premises a young Emirati man walked by carrying a scent that was distinctively Middle Eastern which captivated my senses. However, since we were strangers it would hardly seem appropriate for me to walk up to the man and ask him what scent he was using, right? Well, as things would have it entering the I Love Dubai store as we were browsing through the items on display we found a section where local perfume were sold. God was smiling upon us, since after a few sniffs we chanced upon a perfume called Al Qasr Almalki. Bingo! 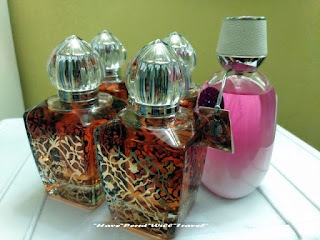 We found our Habibi scent Masha ‘Allah, as the Emiratis would say. We counted our blessings that we were able to find this perfume since it was out of stock in online websites like uae.souq.com. We then headed south west along The Walk, a leisurely promenade along the waterfront where we saw a lot of stylish boutiques and al fresco dining. Barely five hundred metres along The Walk we were astonished to find a café that was a sight for sore eyes… Papparoti! with a middle eastern setting? Despite having had our breakfast a half an hour ago we just had to drop by and sample their teh tarik, lol. We resumed our walk to the end of the promenade were a small fair was taking place. We gravitated to a stall selling stuffed toys and Brendan fooled around with a life sized tiger while Sern dutifully obliged by taking a few shots (me too). We then turned north west towards the beach, and then headed north east along the famed JBR Beach, a fascinating stretch of sand facing the Persian Gulf that deserved its own separate post. After a good hour at JBR Beach we headed back towards the Marina, south east along Al Gharbi Street and across the bridge. In no time we were back at Nuran to rest and relax. Tomorrow will a very eventful, exhilarating and heady day… so stay tuned!